TalesWeaver is a Korean online game created by Softmax. The game plot is based on the Children of the Rune, a Korean novel. It is currently kept in Nexon. 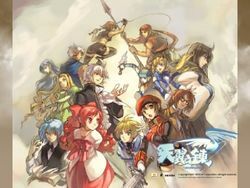 It is a game that has 8 episodes and 1 character unique to TalesWeaver (compared to 4Leaf, where most of the playable characters came from). TalesWeaver currently has a server in Korea, Taiwan and Japan. A main Chinese server was created but taken down, and had been set up again in summer 2007 by TianCity. Around 2008, Hangame deployed their own Talesweaver server under Nexon as a Japanese server. The game is set in a fictional kingdom called Anomarad. There are four major cities that the player can travel to: Narvik, Laydia, Clad and Kaul. Other major cities have been added in Episode 2, such as Keltica, Eltivo and Cardiff. Talesweaver is based on the popular fantasy novel Children of the Rune (author Min-hee Jeon). Characters featured in the novel appear in Talesweaver to provide fans of Children of the Rune with a unique chance to experience stories beyond the original novel. The world of Talesweaver was vividly created in Children of the Rune, which provides a foundation on which Talesweaver's detailed stories can unfold. Talesweaver users feel as if they are reading an engrossing story when playing the game. Currently, there are a total of 12 main characters that appear in Talesweaver and each has his and her own story and their stories intertwine to give life to the world of Talesweaver and also create room for new characters and more stories. Talesweaver is an online game but users can also enjoy a rich storyline. Unlike other online games focused on quests and repetitive battles, perhaps the quality that separates Talesweaver from other online games most clearly is its story-based gameplay. The simple yet visually stimulating action and in-game events that utilize cut-ins also play a big role in making Talesweaver a well-rounded MMORPG. While a large number of online games have their users engaging in constant battles for community formation, character development and competition, Talesweaver leads its users naturally through battles and character development through the unique stories of its various characters. Moreover, the single RPG aspect of the game has been kept alive while maximizing the features of an online game to increase the fun by promoting cooperative gameplay (characters with intertwining stories can play together or difficult dungeons can be cleared as a party). Just like in other games, the characters in Talesweaver come at different levels and with a variety of different skills through which they can be developed. But in Talesweaver, character development and skill development are not clearly separated. Characters and skills are both developed by experience levels. While it is up to individual users to determine whether to increase the character level or enhance character skills first, a drastic unbalance in the distribution between the two can make a character vulnerable in battles so decisions must be made thoughtfully. Skills are divided into common skills that can be learned by all characters and unique skills that can be learned by some characters only. While Talesweaver's concept resembles that of a single RPG, meticulous attention has been paid to action in battles and combinations of skills. Depending on how skills are combined, a bigger variety of combos can be used to enjoy battles that are more dynamic. TalesWeaver utilizes the Combo concept, which is especially popular in fighting games. Combos completely change your combat experience, depending on the sequence of skills that you use. Aside from normal and skill attacks, a variety of Combo options-such as pushing the enemy or knocking him down before attacking –can be used to enhance your effectiveness in combat. Weapons also offer different attack ranges, depending on their class and type. Using different combinations of weapons and skills allows you to build different strategies for different combat situations. Another element of combat is Sien, the magic language that can be acquired through events and quests and is required to learn certain skills that use EXP. TalesWeaver also provides various combat features for more frenetic action in battle, like Group Special skills that require multiple players, and Skill Cancellation that allows you to cancel skills while casting. TalesWeaver boasts detailed character animations and stunning special effects that stand above the standard set by other online games. The high definition 2D graphics are primarily displayed in the Isometric Perspective View (Quarter View) to improve the sense of volume and space for characters and objects. The character design mostly focuses on cuteness and simplicity, but characters are still exquisitely detailed for enhanced visibility. Even the maps are designed in the Quarter View, unlike other 2D games where quarter-view objects are simply mounted on backgrounds designed for overhead views. TalesWeaver draws upon the visual benefits of its Quarter View system to its full potential. A display is the best device to experience the advancement of digital technology through. The recent heightened popularity of 3D movies has inevitably influenced the realm of games. But that realm is not the one the now-8-year-old Talesweaver is in. Talesweaver – in service since 2003 – uses 2D graphics which at that time could create the most detailed visuals. 8 years down the track, Talesweaver still uses superb-quality 2D graphics to provide users with visuals that only 2D graphics can create. 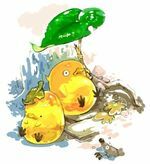 While 3D is the better option in creating more realistic graphics, 2D can be more suitable for creating cute and traditional game graphics. One thing is for sure, Talesweaver's detailed and slick graphics definitely do not fall short of those of games released 8 years later. Users in the 3D Era will find something quite refreshing and enjoyable in Talesweaver's rich story adorned with flawless 2D graphics.